Robert Prechter - End is Nigh? 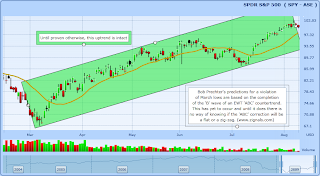 Robert Prechter of Elliot Wave International has gone bearish, bringing to an end his bullish February/March rally call. In the video he talks about a break of March lows - no chump change, so is this likely? The core thesis is based on how Elliot Wave Theory (EWT) applies to the current cyclical bear market. In EWT, trends move in five phases (waves) and counter-trends in three. 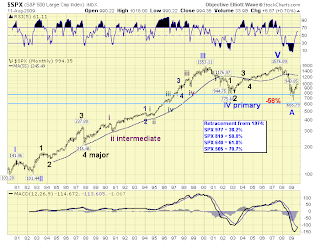 According to Anthony Caldaro of Objectiveelliottave.com the last 25+ years have seen a five wave bull trend which has been followed by a two wave of three bear counter-trend. Assuming the second wave of the counter-trend has completed all that is left is the inevitable third wave of the counter-trend; this is what Bob Prechter is looking at as the way forward. Counter-trend patterns are labelled "ABC", each letter marking the end of the respective wave. The assumption Bob Prechter is making is that the 'B' wave of the "ABC" counter-trend has completed and that the 'C' wave (down) has begun. Unfortunately, while Bob's predictions could come through there is no indication, yet, that the 'B' wave has completed. The bull trend which kicked off in March is still very much alive and would only run to a confirmed break if the July reaction low was lost as support; then - based on the reversal point of the 'B' (the eventual high of the rally) could projections be drawn as to a downside target. EWT countertrends come in two varieties; zig-zag and flat corrections. What Bob Prechter is looking for is a zig-zag correction. In zig-zag corrections the length of the move from A-to-B is projected down from price point 'B' to predict the price low for the B-to-C leg. This projection can be relative or absolute. If were to consider this as true and assumed the 'B' wave peaked at 1,018 for the S&P, then the next phase down (i.e. the 'C' wave) would set targets for the S&P of either 108 (yes - a 910 point loss) or 587 (a 57.7% loss). The former is highly unrealistic and the latter, while unpalatable, is not as bad as what has gone before. However, it excludes the option for an "ABC" flat correction. In this case the 'B' wave rallies close to where the 5th wave of the prior trend move ended. In this case the S&P could get close to 1,575 (I would go as far as to consider the 1,440 level as sufficient to rank as a full retracement). In this scenario the 'C' wave still evolves and is nasty, but the worst case scenario becomes a test of March lows, perhaps seeing support kick in at the 750 level, rather than a meltdown into the 500s. So what Bob Prechter is suggesting is not a slam dunk. On the negative side, a 'C' wave will mean an end to the bear-market-rally. But, on the positive side, there could still be plenty of juice in this rally. The other positive is once an "ABC" correction completes it will have cleared the way for a new cyclical bull market 5-wave move. There are no gurus in this market; just voices at points of reversal. It all plays like musical chairs rather than words from the wise.